Montreal weather is notoriously indecisive. Showers, snow, freezing rain, followed by warm sun and elimination of all torrential evidence in one day? Entirely possible. Sometimes probable. Montreal has a humid continental climate. Summers are warm and humid, with temperatures in the low 80s, but it can get even warmer. Meanwhile, winters are generally cold, snowy, and windy. Temperatures below freezing are normal. Snow is typically on the ground December through March; the city receives an average of 83 inches of snow per year and 39 inches of rain. The city gets a decent amount of sunshine during the summer, typically around nine hours per day in July, but winters are dark, with just three hours of sun from November through January. If you plan on making the best of your time in Montreal which, incidentally, is not very hard to do, consider getting the scoop on local weather trends and dress the part. After all, as said author Alfred Wainwright, "There's no such thing as bad weather, only unsuitable clothing." Spring is mostly unstable, with variable temperatures, snowfall, and frost. March is still very much steeped in winter in these parts, but the edge is usually off by the second half of the month. Some years feature spring thaw this time of year, yet others see winter persist. It's typically still cold well into April, but by May, days are warm enough to spend time outdoors. What to pack: Even during spring in Montreal, a heavy coat will come in handy. Up through May, you'll also need thick gloves, a scarf, and a hat. By the end of the season, a light winter jacket with layers beneath it will be sufficient for most days. Water-resistant or waterproof boots are a good idea throughout the season. 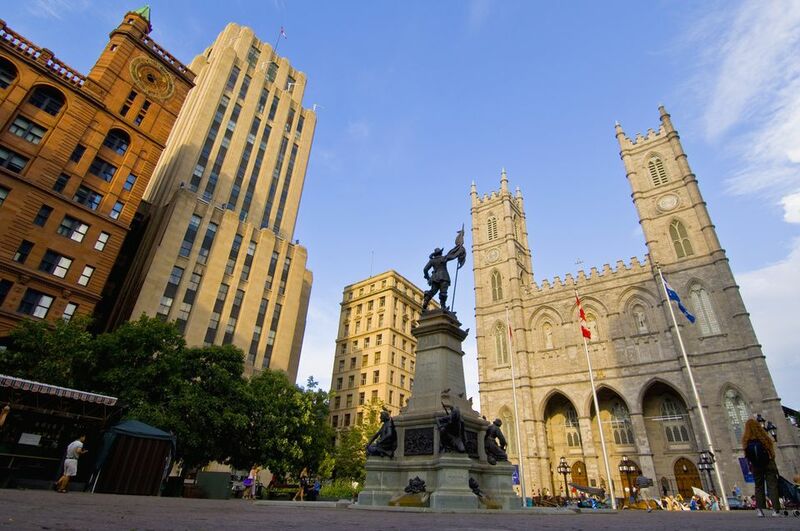 Montreal summers are warm and humid, thanks to the Saint Lawrence and Ottawa Rivers. July is the warmest and sunniest month, with temperatures cooling down a bit come August. There are plenty of cool and cloudy days, and an afternoon thunderstorm can mar even sunny days. Days of extreme heat are possible too; in July 2011, the temperature reached 97 degrees Fahrenheit (36 degrees Celsius). What to pack: By summertime, lighter clothing such as shorts and skirts is OK for most days, but you'll still want to pack a cardigan or light jacket for days when temperatures cool down. Given Montreal's humidity, opt for lighter fabrics like linen and merino wool. Pack sunscreen and sunglasses, too. Fall in Montreal, especially September and October, are pleasant. The city is known for "Indian summers" in September: Long, warm days. Temperatures decrease rapidly and the wintry weather that Montreal is known for usually occurs by the middle or end of November. What to pack: As temperatures drop, bring along clothing that can be layered: Think long-sleeved shirts, sweatshirts, jackets, and long pants. Evenings will begin to cool down by October, so bring a heavy fleece or jacket to put on over your outfit. Closed-toed shoes are a must and depending on the month, insulated and waterproof boots can be useful as winter draws closer. Winter in Montreal runs from mid-November through mid-March. January is statistically Montreal's coldest month, with temperatures not unlike that of Moscow, Russia. The city's freezing temperatures are accompanied by two unique weather phenomenon: the Blizzard, a gusty north wind, and the Barber, a cold and wet wind that usually carries over from the Gulf of St. Lawrence. It typically snows for several days per month during the winter, and snowstorms with heavy accumulation can occur. In 2012, the city received 17 inches in just 24 hours. What to pack: If you're visiting Montreal during the winter, make sure to pack long-sleeved shirts and sweaters, as well as sleeveless or short-sleeved shirts that can be layered underneath. You'll need a more substantial top layer such as a wool or down jacket and then, a heavy waterproof coat on top of that for snowy or rainy days. Insulated and water-resistant shoes are a must—and don't forget winter weather accessories such as a scarf, gloves, ear muffs, and on some days, a buff to cover your face and mouth.